In the ancient Mediterranean world, pearls were valued for both their uniqueness (no two are alike) and their brilliance, which was far greater than the uncut gems worn by the Romans. Owning a pearl was considered a great luxury. Earrings like these, with four pearls apiece, would have made quite a statement about the owner's wealth. Here not only pearls but also garnets are suspended in round gold pieces, each framed by an openwork pattern resembling the Egyptian protective motif called the "wedja-eye," which had an apotropaic function. 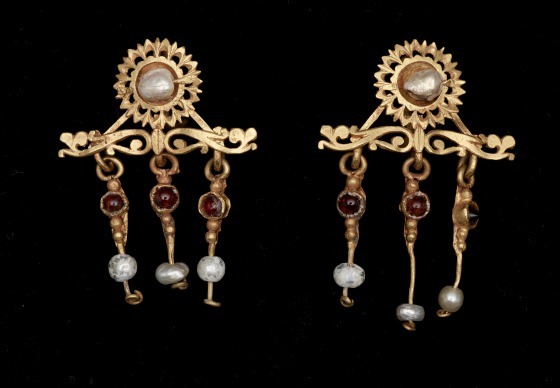 The sound of the pearls and garnets rattling against each other would also have drawn attention to the person who wore these earrings, heightening others’ awareness of her presence and status. This is an example of the true height of luxury in the Roman Empire. 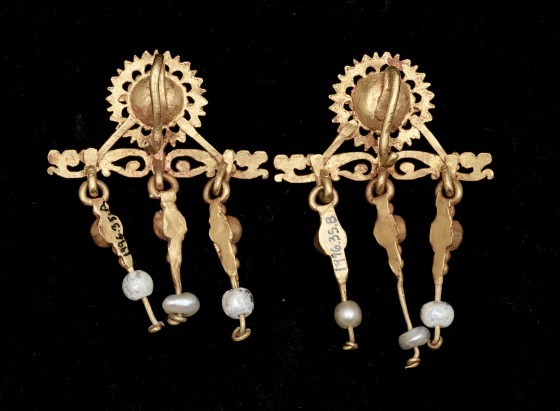 Barbara Deppert-Lippitz, Ancient Gold Jewelry at the Dallas Museum of Art (Dallas: Dallas Museum of Art in association with the University of Washington Press, 1996), 146.